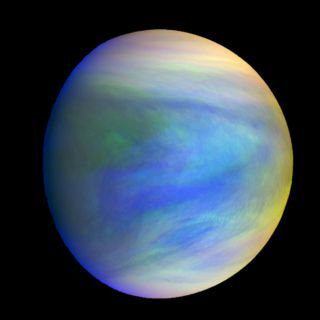 A composite image of Venus as seen by Japan's Akatsuki spacecraft. The clouds of Venus may provide an environment capable of supporting microbial life, some researchers say. STANFORD, Calif. — Venus shouldn't be dismissed as a possible abode for life, some scientists stress. Sure, the planet's surface is famously inhospitable today — bone-dry and hot enough to melt lead, with an atmospheric pressure 90 times greater than that of Earth at sea level. To feel that same amount of squeeze on our planet, you'd have to descend about 3,000 feet (900 meters) into the oceans. Venus may therefore have been a habitable planet "for much of solar system history," astrobiologist David Grinspoon, a senior scientist at the Planetary Science Institute in Tucson, Arizona, said Thursday (April 12) during a talk at the Breakthrough Discuss conference here at Stanford University. And Earth's so-called sister planet could potentially support life to this day, at least in places. Though Venus' surface has gone hellish hothouse, the environment a few dozen miles high in the skies is pretty benign, Grinspoon and others have stressed. Temperatures and pressures up there are close to those of Earth's surface, so it's possible that Venusian life — if it ever existed — didn't die out with the dramatic climate shift long ago but rather retreated into the clouds. Those clouds are made mostly of sulfuric acid, which would seem to argue against the Venus-life idea. But over the last few decades, biologists have found all manner of hardy microbes here on Earth capable of tolerating similarly extreme conditions. And these same acidic Venus clouds could potentially provide chemical energy to any microbes that may be floating around up there, researchers have said. Intriguingly, Venus' upper atmosphere also abounds with a mysterious compound that absorbs ultraviolet (UV) radiation, the high-energy light that causes sunburns here on Earth. Nobody knows what this stuff is or where it comes from, but some scientists have speculated that it could be a biological pigment — perhaps a sulfur-based sunblock of some sort. Grinspoon isn't claiming that life exists on Venus, just that it's a possibility scientists should consider more seriously. And some of his colleagues agree. For example, during a separate panel discussion here Thursday, the participating scientists were asked which solar system body they would visit first to search for alien life. Mars, the Jupiter moon Europa and the Saturn satellites Titan and Enceladus all got votes. But one of the Europa proponents — Cynthia Phillips, a planetary geologist at NASA's Jet Propulsion Laboratory in Pasadena, California — also gave a shout-out to the second rock from the sun. "I think we should really take another look at Venus," Phillips said.